I bought 10 pounds of strawberries earlier this month and we have been enjoying a lot of strawberry smoothies. 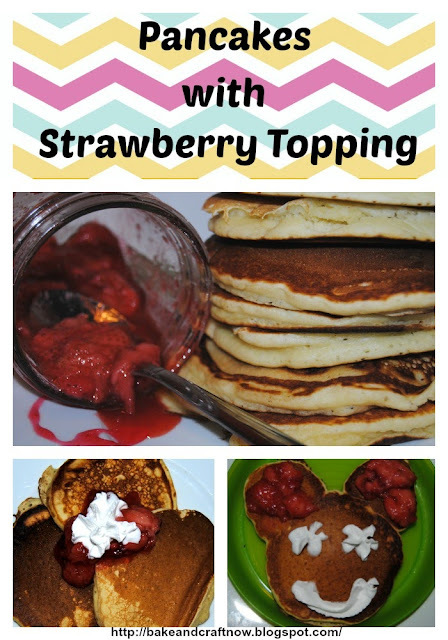 To mix it up, today, I decided to make some pancakes with strawberry topping. My husband swears that homemade pancakes are better than those from the box so I whipped up some pancake mix while my strawberries were roasting into a delicious syrupy strawberry topping. Between prep and cooking it took me about 45 minutes. I started with frozen strawberries but you can definitely use fresh strawberries. Leave in oven for an additional 10-20 minutes, the longer they stay in the oven the more syrup you should get. Remove from oven and place in a jar or container to serve immediately or store in the fridge for up to 3 days. Add milk and vinegar in a large bowl together, let it sit for about 5 minutes, add the eggs and melted butter and mix (I used my kitchen aid). In a separate small bowl add the baking powder, baking soda, sugar, and salt together, mix then add into the wet ingredients. Add the flour and mix until smooth. Your batter is ready! In a non-stick pan pour approximately 1/3 c batter per pancake, wait for the pancake to start bubbling then flip to cook the other side. The recipe yields about 15 pancakes.